The Honeybee Festival is Kernersville’s most unique/authentic arts & crafts festival. Held on the third Saturday of August, the festival attracts more than 8,000 people to Kernersville for a day full of wholesome family fun! The Kernersville Honeybee Festival began in 1975 by celebrating the accomplishments of Brady Mullinax, Kernersville’s famous “Bee Man”. The festival now hosts well over 80+ vendors and there will be plenty of activities that every attendee can enjoy. The Kernersville Festival is known for its authentic arts & crafts vendors that come from near and far to be a part of this unique event to showcase and sell their creations. Stroll the shaded pathways through the park to visit vendors selling homemade jewelry, bath products, repurposed items, quilts, wreaths, baked items and more. As you wander through you will notice a bee theme at nearly every booth. The festival would not be complete without HONEY! Did you know local honey is not only delicious, it helps fight allergies during the season. Did I mention the live bee observation hive? We are not only supporting the bee population but educating the community on how important it is to save the honeybee. Visit the Cone Health tent for a brief educational opportunity! Listen to the sounds of live music on our Hawthorne Partners Stage, bring a chair and stay for one performance or hang out all day. The stage will now sit in the parking lot by the entrance of W. Mountain Street. Every year the festival gives live performance opportunities to local musical talent. This year, we will have a great line-up including The BrickHouse Band (12:15-2:15pm) performing an incredible variety of hits spanning half a century of rock’n’roll, soul, funk, and beach — from the Stones to Stevie Wonder, Black Crowes to Bon Jovi, Tom Petty to Tommy Tutone, Commodores to Cee Lo Green. They combine tight harmonies, a solid rhythm section and blazing instrumentalists to create a powerful, exciting and entertaining ensemble. Their non-stop show is well-tuned to keep the party going and the dance floor packed. Singer-songwriter Cooper Alan (2:30-4:30pm) who is a 22-year-old performer with almost a decade of experience on the country music scene. He and his band, formerly known as “Below The Line,” have built a strong resume by opening for artists like Travis Tritt, The Eli Young Band, Kip Moore, Echosmith, and many more. Come out to the Honeybee Festival to see Cooper Alan perform live!! ​Throughout the day there will be several demonstrations throughout the park including, Triad Area Blacksmith’s, TRu Taekwondo Center, and 100.3 KISS FM personality Kelly Hilderbrandt. The radio station will be hosting a Beat KISS FM (11:30AM-12:00PM). Listeners can go to 100.3kissfm.com/honeybee to sign up for the opportunity to participate in “Beat Kiss FM” for their chance to win 2 tickets to see P!NK at the Charlotte Spectrum Center on Saturday, March 9, 2019. Each participant will take a turn to listen to a song and name the song and artist. Each round will be more difficult and last 3 standing go against the “Kiss FM talent on site.” The last 1 standing wins the P!NK tickets. Miss Mary’s Family Fun Hive will keep your busy bees happy throughout the day and is always a blast for all ages! Located in the grassy field off W. Mountain Street in the park there will be fun carnival rides, face painting, ponies, train rides, bungee trampoline and toy vendors. Please be sure to visit various kid friendly vendor booths and thank our sponsors, including Kernersville Magazine and Vestal Buick GMC. Last but not least, treat yourself to the delicious menu options including, BBQ, Tacos, Burgers, Pitas, Sandwiches, Wings, Nachos, Funnel Cakes, Fried Oreos, Popcorn, Ice Cream, desserts and more! It is a walker’s paradise with visual delights and mouthwatering treats at every stop. Mark your calendar for the 2018 Cone Health MedCenter Kernersville Honeybee Festival that will take place on Saturday, August 18, in Fourth of July Park from 10:00AM- 5:00PM. 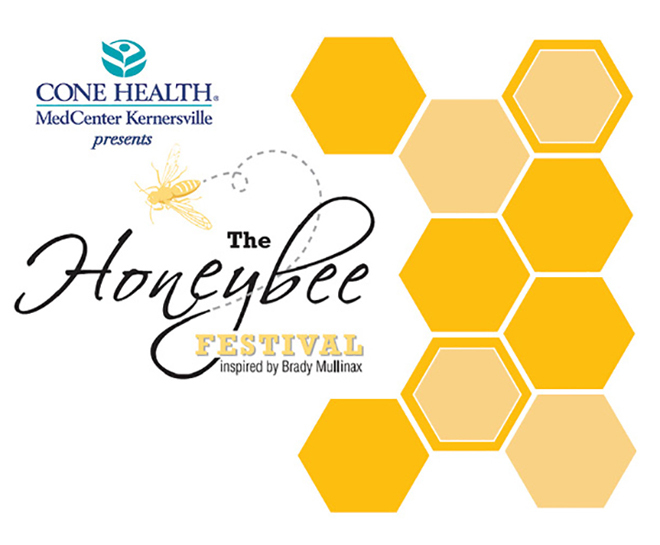 To stay up-to-date on the latest information about the Kernersville Honeybee Festival visit our website at www.kvhoneybee.com. We look forward to seeing everyone at our traditional family festival in Kernersville! Buzz through and see what our town has to offer!